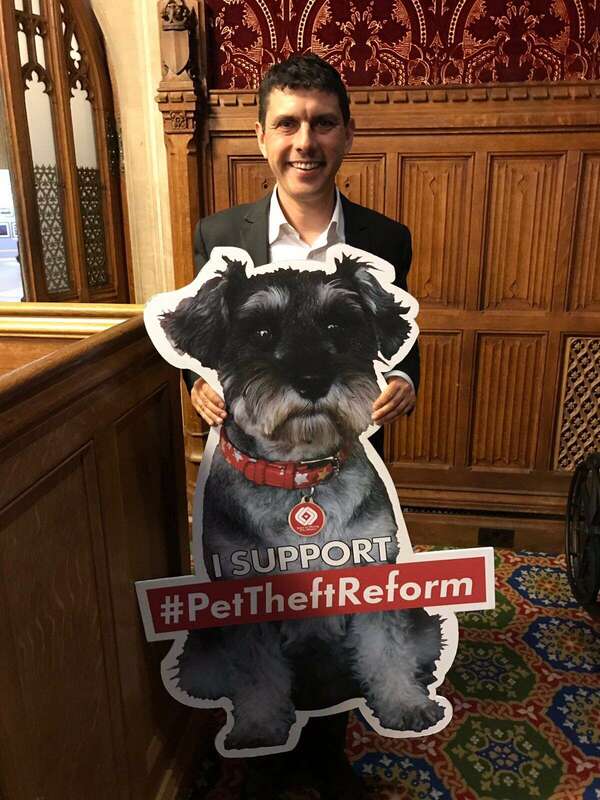 Thank you to @GarethJohnsonMP for hosting the @SAMPAuk_ #PetTheft drop-in @UKParliament, being such a positive voice in the #PetTheftDebate & his ongoing support of #PetTheftReform”The courts’ inability to deal adequately with dog theft is at the root of so much of the problem, and it is not surprising that many people see it as a high-reward, low-risk crime. I worked in the criminal justice system for about 20 years before coming to this place, and I saw an increasing propensity for people to commit such offences. The offences chop and change; the hon. 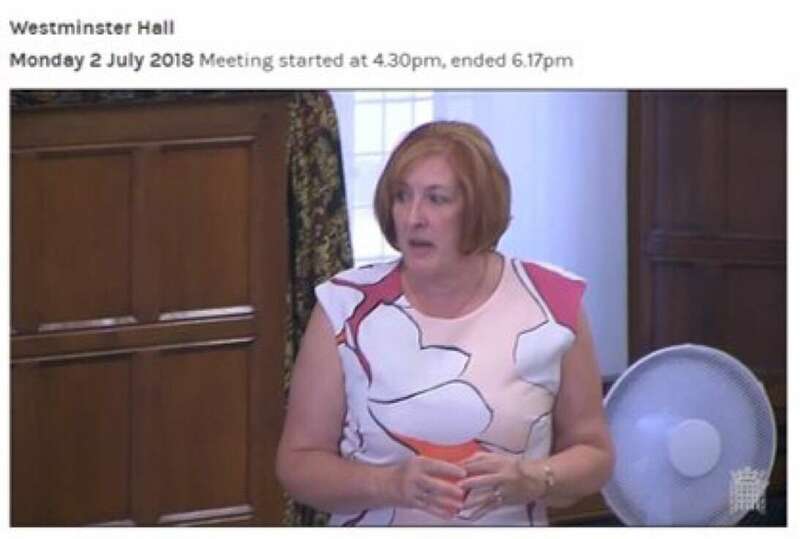 Member for Hartlepool mentioned metal theft, and other crimes that are seen as high reward and low risk gain popularity among the criminal classes. At the moment, this country is suffering because criminals see dog theft as an attractive crime. It is incumbent on this place to stop that. 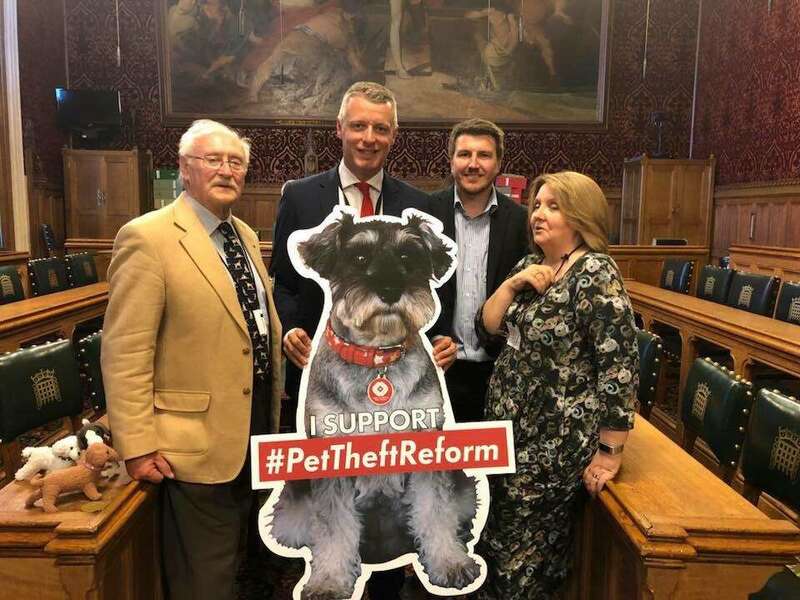 If we do not act, the problem will simply get worse.” Special thanks to @MikeHillMP for leading the #PetTheftDebate & making the case for #PetTheftReform.“Too many pet thieves have got away with light sentences because of unacceptable & irrelevant guidelines. 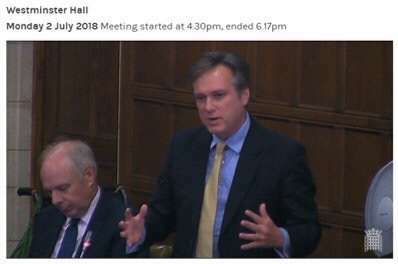 All pets should be treated equally, regardless of their monetary value” #AnimalHero John Howell MP Henley:-John Howell (Henley) (Con)My constituency has a high level of rural crime that targets farm dogs. Does the hon. 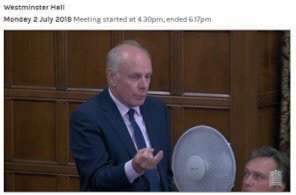 Gentleman agree that that is a particularly heinous crime, in that farm dogs have value because they have skills that can be used on a farm but they are also pets that are loved by their owners? 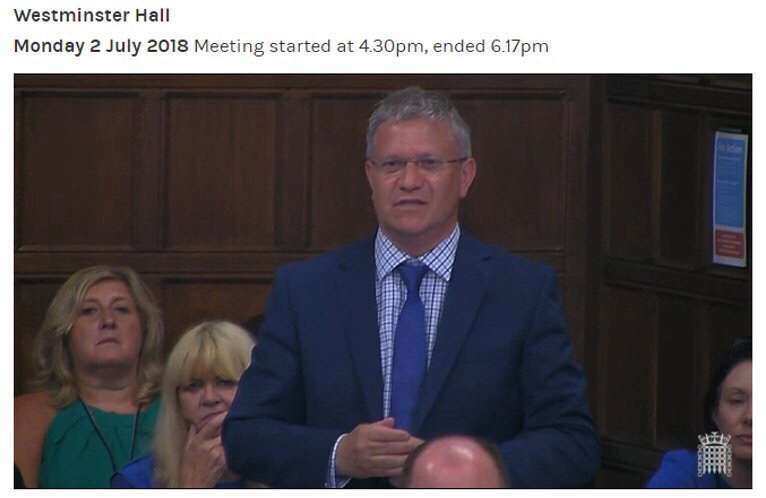 Thank you to @Simonhartmp for taking the time to add his voice to the #PetTheftDebate and for supporting #PetTheftReform.”dogs themselves may be worth less than five hundred quid, but their breeding potential may be worth several thousand pounds over a period of time” Thank you to @AndrewRosindell for taking the time to add his voice to the #PetTheftDebate and for supporting #PetTheftReform.Andrew Rosindell: “An animal should not just be seen as a piece of property; losing one is really like losing a member of the family” Thank you to Colonel Bob Stewart for taking the time to add his voice to the #PetTheftDebate and for supporting #PetTheftReform.Bob Stewart: “The Theft Act 1968 seems to have removed the requirement to deal with people who steal dogs, which is a shame” Thank you to Mr Ian Liddell-Grainger for adding his voice to the #PetTheftDebate and supporting #PetTheftReform.”they are being stolen for three purposes: first, to be pets, which is straightforward; secondly, for dog fighting, which is horrific; and thirdly, for puppy farms” Thank you to @jimforcovsouth for taking the time to add his voice to the #PetTheftDebate and for supporting #PetTheftReform.Jim Cunningham: “if someone loses their dog or it is stolen, then regardless of the value, it is like a death in the family”Yesterday my colleague @MikeHillMP secured a vital debate on #pet theft. 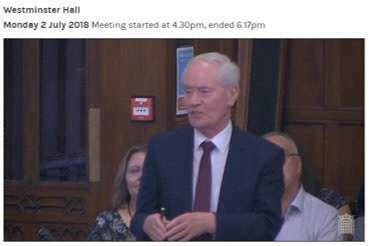 Many people from #Coventry write to me about #animalwelfare and I was happy to speak about the important bond that we often share with pets in the household. 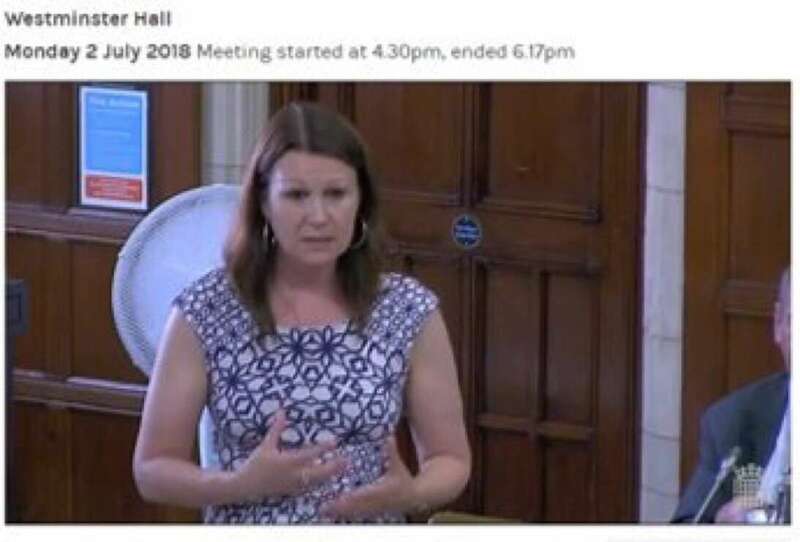 Thank you to @SueHayman1 @LabourDefra for taking the time to add her voice to the #PetTheftDebate and for supporting #PetTheftReform.Sue Hayman: “we need to ensure that the proper sentences are given and that prosecutions are increased” Thank you to @GeorgeFreemanMP for taking the time to add his voice to the #PetTheftDebate and for supporting #PetTheftReform.George Freeman: “we have to correct the law so that people who steal dogs are punished properly” Thank you to @HenrySmithUK for taking the time to add his voice to the #PetTheftDebate and for supporting #PetTheftReform.Henry Smith (Crawley) (Con)I congratulate the hon. 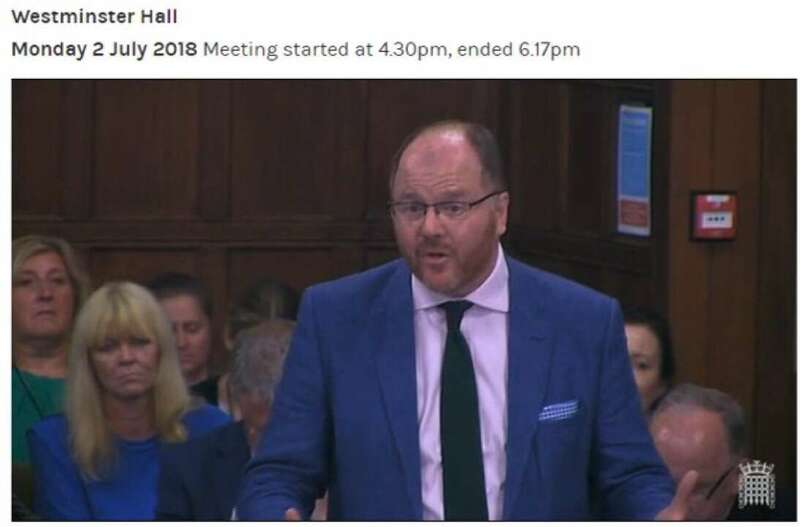 Gentleman on bringing this important debate to the House. As many hon. Members have said, pets are part of people’s families. Will the hon. 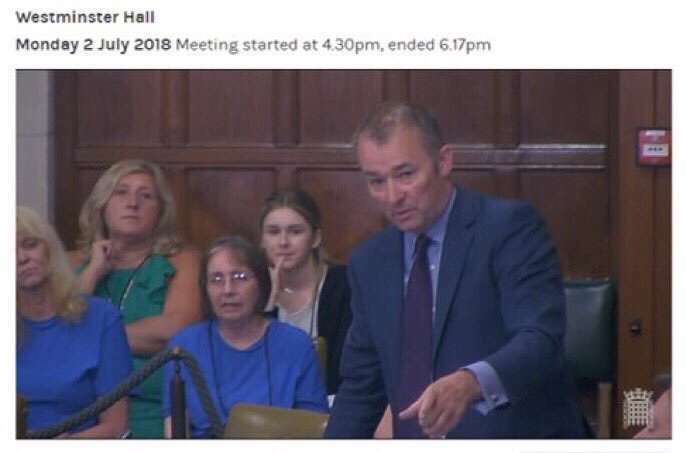 Gentleman join me in not only congratulating the Environment Secretary on increasing the sentence for animal cruelty to five years, which is important, but calling for the definition of animal cruelty to be extended to include the theft of much-loved pets? 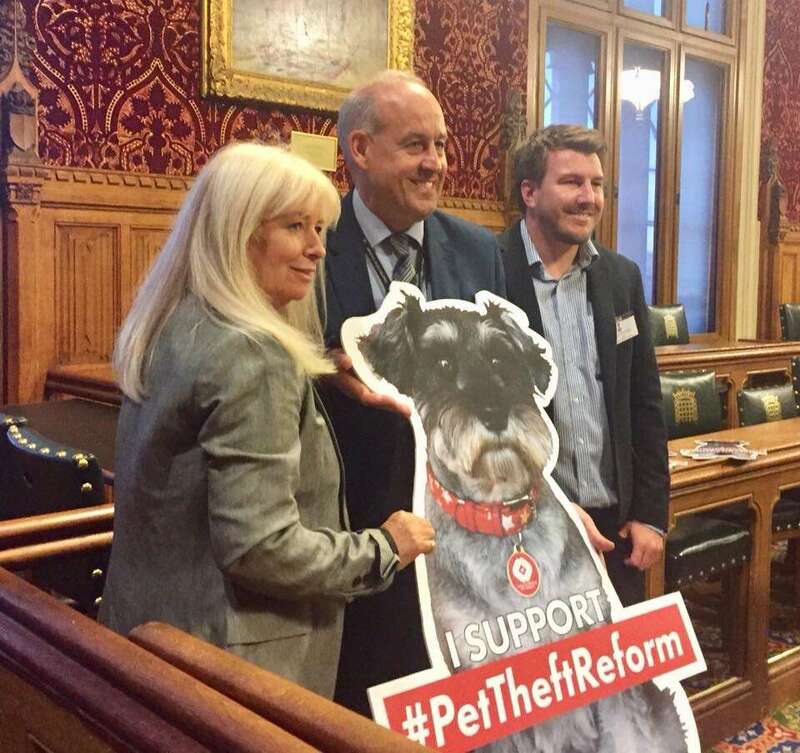 Thank you to @Y_FovargueMP for adding her voice to the #PetTheftDebate and for supporting #PetTheftReform.”Does my hon. Friend agree that the microchipping law was a missed opportunity? 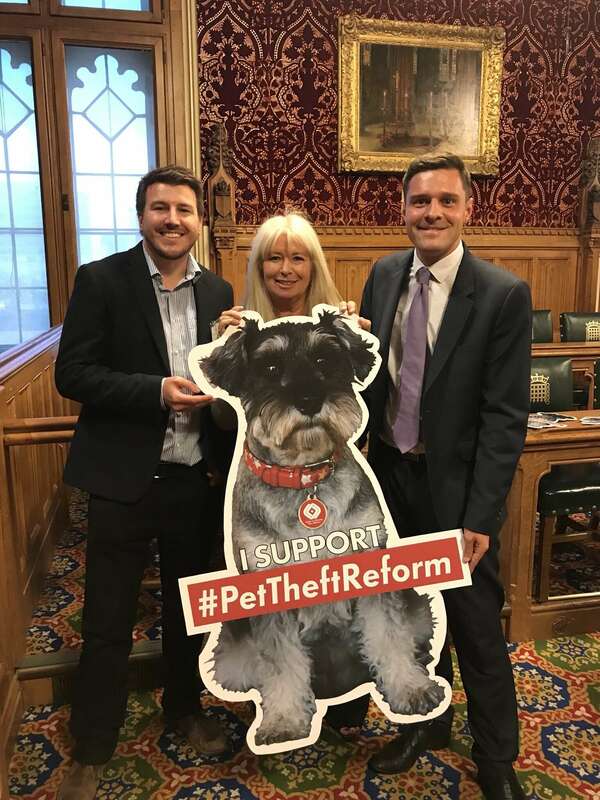 [..] Maybe it is time for another debate on how we can improve the microchipping laws.” Thank you to @RossThomson_MP for taking the time to meet the @SAMPAuk_ team, being such a positive voice during the #PetTheftDebate, and taking #PetTheftReform to the next level with the #PetTheftBill. Excellent work! RT to thank Ross for helping #ProtectOurPets”When I am asked what the most difficult part of my job as an MP is, I always answer: “Monday mornings”. That is not because I hate having to roll out of bed to catch a 7.15 am flight, but because it breaks my heart every Monday morning to leave my Jack Russell-Yorkshire terrier cross, Poppy. The fact that she knows I am leaving and does her utmost to make me feel guilty about it just makes heading to London so much harder. I could not imagine ever returning home to find that Poppy was not there. I do not even want to contemplate the notion of her being stolen. For me, like millions of pet owners across the UK, Poppy is my family. To be honest, I am like a proud dad. She has her moments, like any teenager. She can be relentless with her ball and her ducky, but I love her to bits, and I would hate for anything to happen to her. Our pets are much more than possessions. 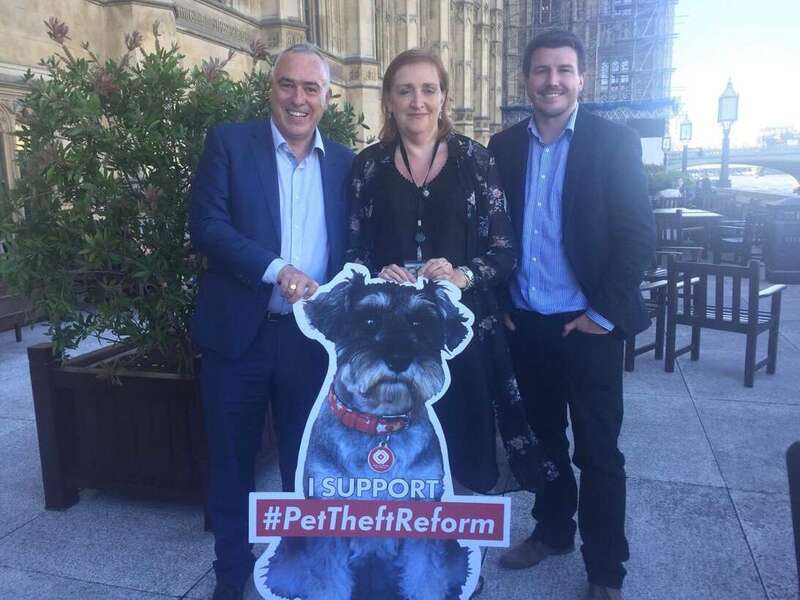 It is not difficult to appreciate how truly awful, heartbreaking and simply devastating a crime pet theft can be.” Thank you to @DrLisaCameronMP @APDAWG1 for supporting #PetTheftReform. 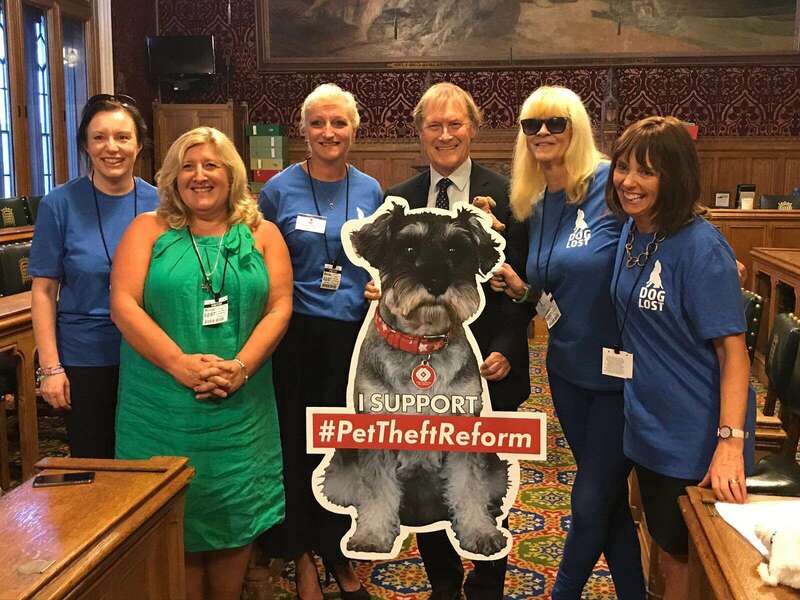 We really appreciate you taking the time to meet the @SAMPAuk_ team and for being a positive voice in the #PetTheftDebate”People have spoken today of their love for dogs. My dog, Rossi, is a French bulldog. 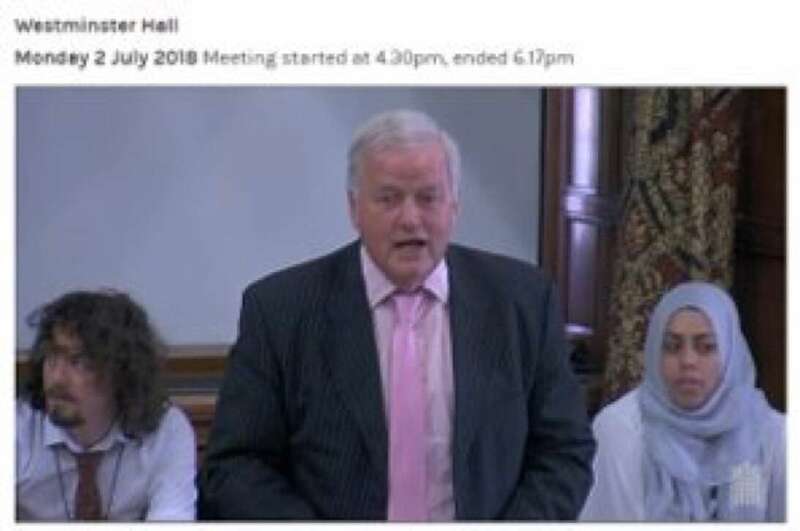 Having looked at the figures for pet theft, I am aware that that is exactly the type of dog breed that is being stolen—it is near the top of the list. French bulldogs are often used for breeding and puppy farming, which makes me think that perhaps there are links with pet theft. I would be bereft if something happened to Rossi out in the garden where he likes to roam.” Thank you to @GilesWatling for supporting #PetTheftReform. 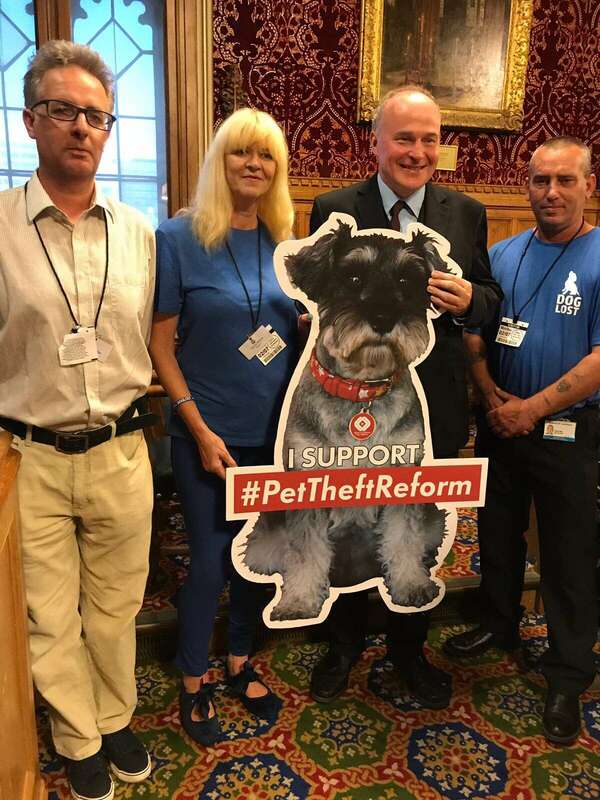 We really appreciate you taking the time to meet the @SAMPAuk_ team and for being a positive voice in the #PetTheftDebateMP @GilesWatling says at #PetTheftReform Westminster Hall Debate: “The theft of possessions, jewelery etc are nothing compared to the theft of a pet. The people who do this are trading in misery”I maintain that the current position is not working. It does not deter or limit pet theft; in fact, I would argue that pet theft is getting worse. Pet theft should be identified as a separate criminal activity and be covered by its own law. 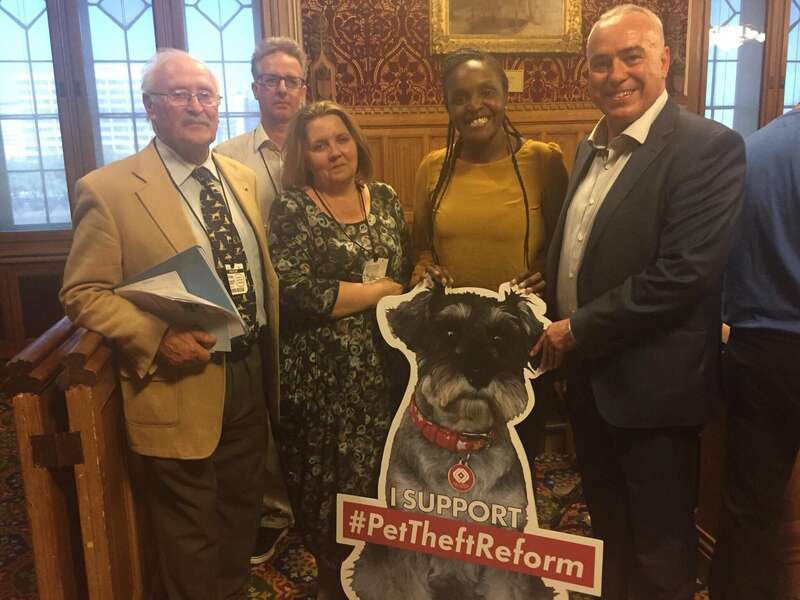 Thank you to @FionaOnasanyaMP for supporting #PetTheftReform. 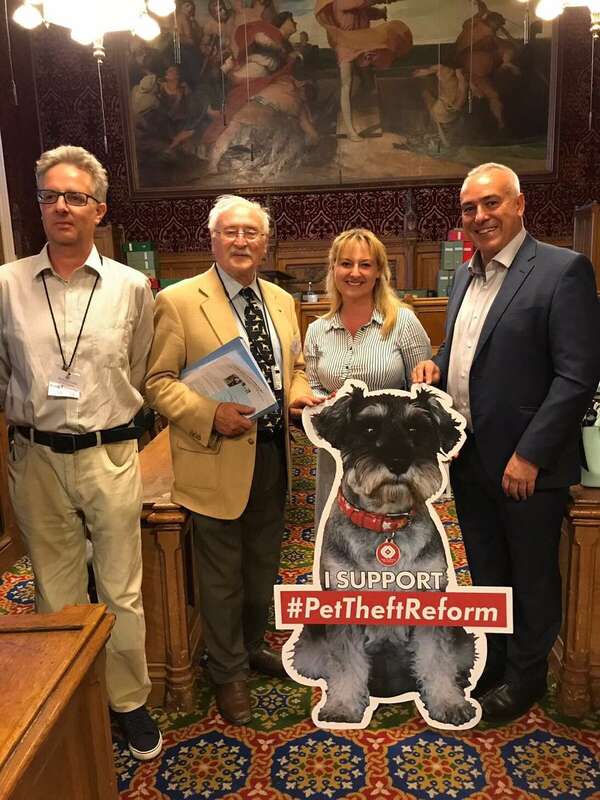 We really appreciate you taking the time to meet the @SAMPAuk_ team and for being a positive voice in the #PetTheftDebate.This is not just about pets? This is about a life and about a family’s life. The law needs to bear that in mind. This is not about monetary value, but about a life being taken. If a child was taken, we would not say, “They are only a couple of years old, so we think they are not worth that much.” This is a life, and it matters to the family. We really appreciate you taking the time to meet the @SAMPAuk_ team @UKParliament, Andrew Mitchell MP. 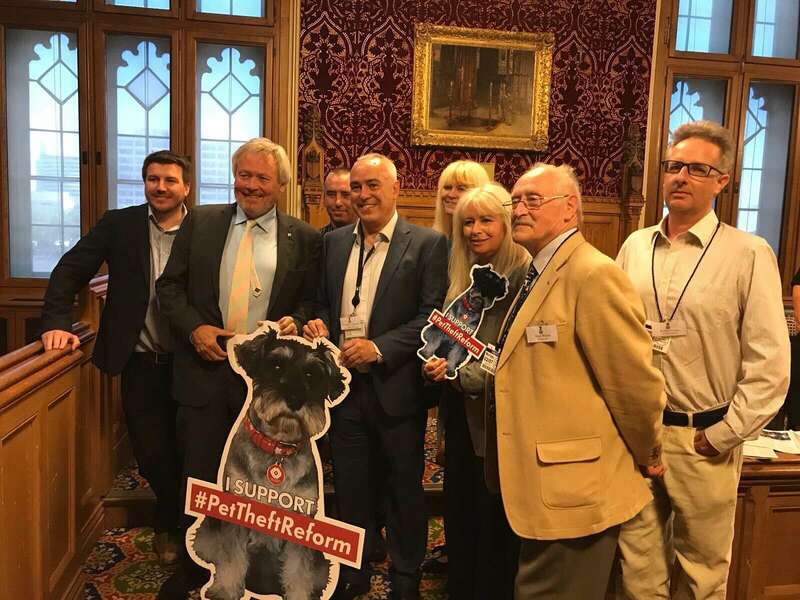 Thank you for supporting #PetTheftReform We really appreciate you taking the time to meet the @SAMPAuk_ team @UKParliament, @DavidHansonMP. Thank you for supporting #PetTheftReform. We really appreciate you taking the time to meet the @SAMPAuk_ team @UKParliament, @sandyofipswich. Thank you for supporting #PetTheftReform. We really appreciate you taking the time to meet the @SAMPAuk_ team @UKParliament, @LukePollard. Thank you for supporting #PetTheftReform. We really appreciate you taking the time to meet the @SAMPAuk_ team @UKParliament, Sir David Amess @amessd_southend. Thank you for supporting #PetTheftReform. We really appreciate you taking the time to meet the @SAMPAuk_ team @UKParliament, John Grogan @KeighleyLabour. 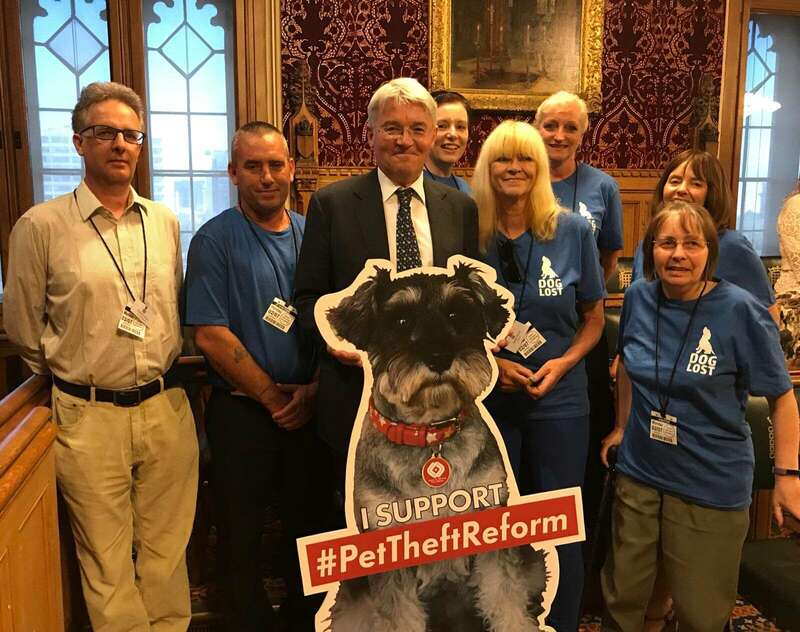 Thank you for supporting #PetTheftReform We really appreciate you taking the time to meet the @SAMPAuk_ team @UKParliament, @alexsobel. 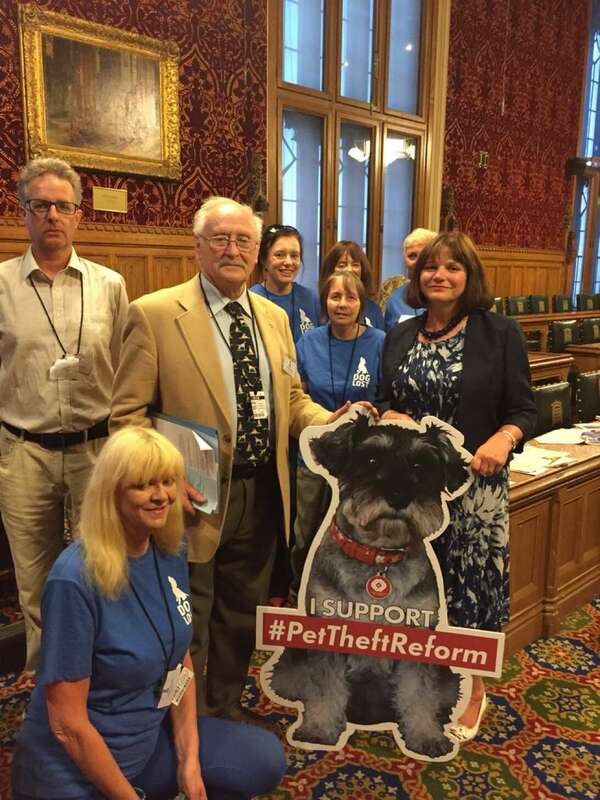 Thank you for supporting #PetTheftReform Alex Sobel MP Thank you to @yasinmpbedford for supporting #PetTheftReform. 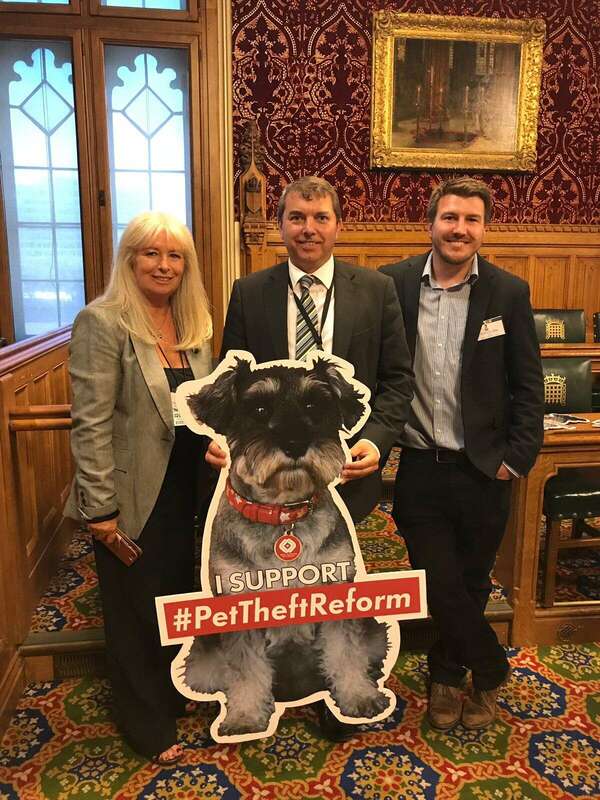 We really appreciate you taking the time to meet the @SAMPAuk_ team and for being a positive voice in the #PetTheftDebatePleased to lend my support to the #PetTheftReform campaign today. 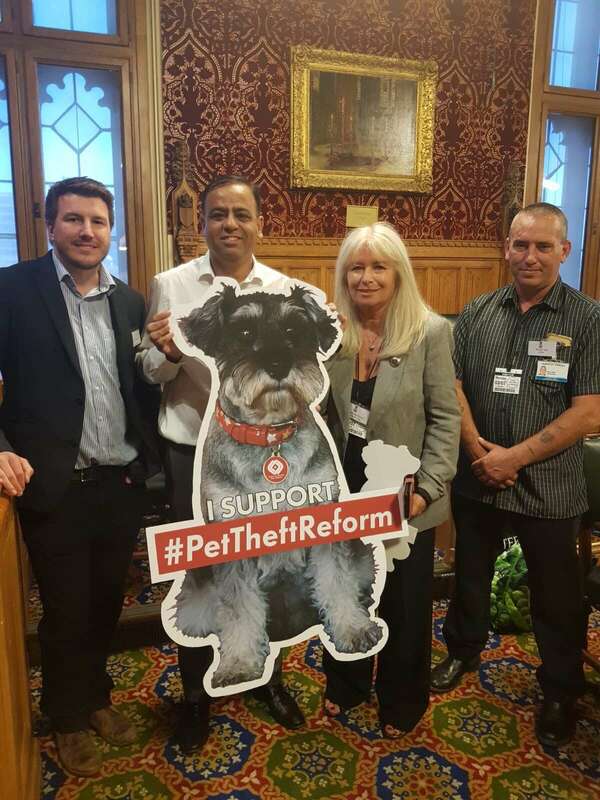 Pet theft should be a serious offence – I’m backing stronger penalties Thank you Julie Cooper MP Today I will be supporting #PetTheftReform Pet Theft often has a devastating effect on families when is a much loved pet is taken. @DoglostUK A small tweak to existing legislation could make a world of difference! 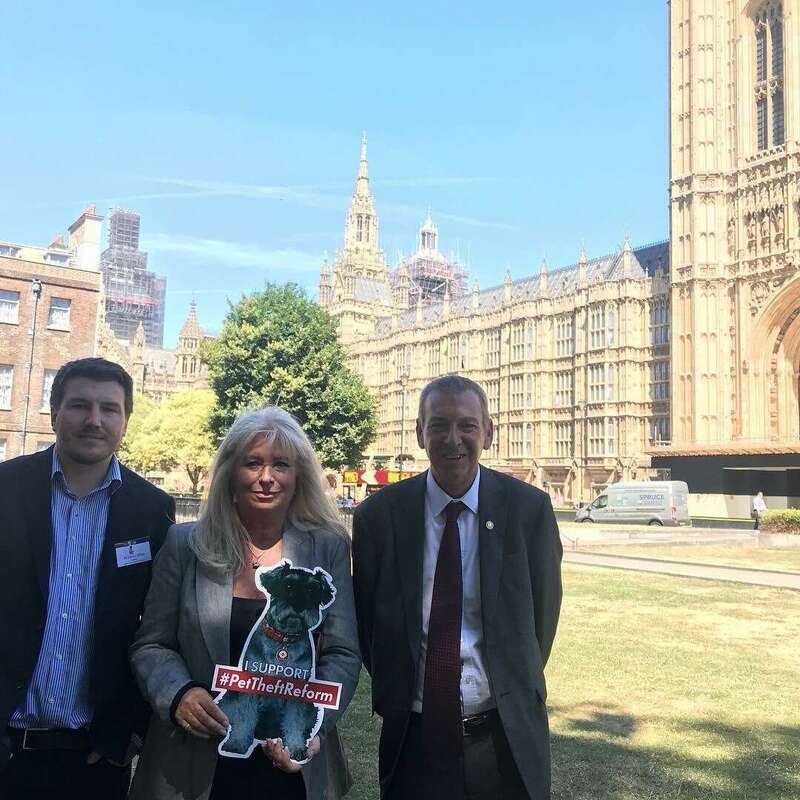 We really appreciate you taking the time to chat with @SAMPAuk_ co-founder @VGSHelpingPets about #PetTheft, @neil_parish @CommonsEFRA. 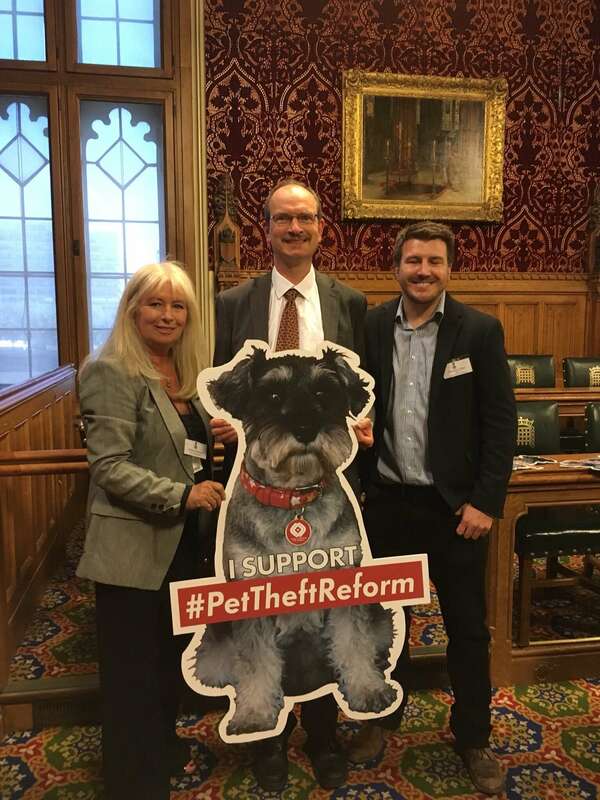 Thank you for supporting #PetTheftReform We really appreciate you taking the time to chat with @SAMPAuk_ legal advisor @John_Cooper_QC and I about #PetTheft, @emmadentcoad @KensingtonCLP. Thank you for supporting #PetTheftReform. 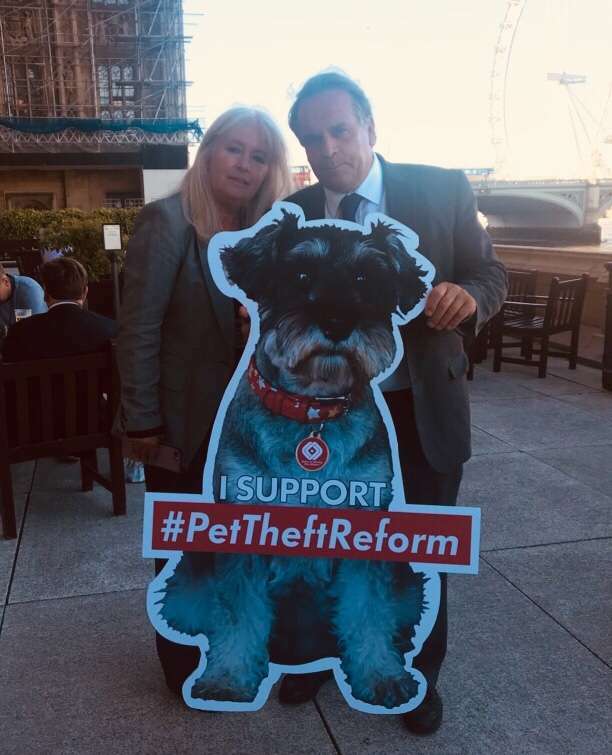 Thank for your support Jo Platt MP for Leigh: “While I cannot be at the debate today, I 100% support the #PetTheftReform campaign. 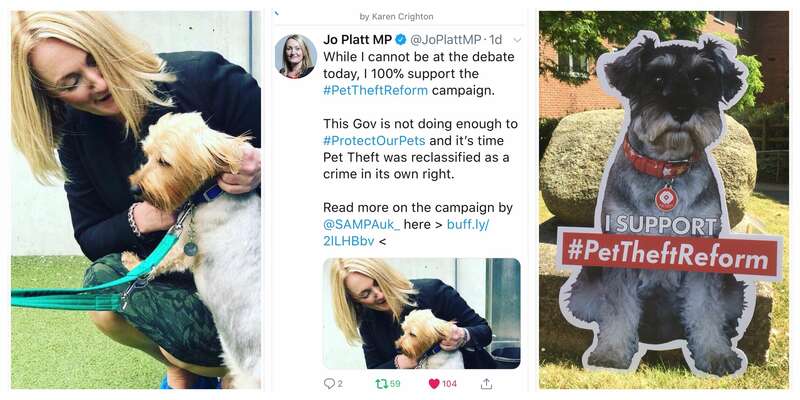 This Gov is not doing enough to #ProtectOurPets and it’s time Pet Theft was reclassified as a crime in its own right.Read more on the campaign by @SAMPAuk_ here > http://www.stolenandmissingpetsalliance.co.uk/Tweet:- https://twitter.com/joplattmp/status/1013799634597101568?s=21. 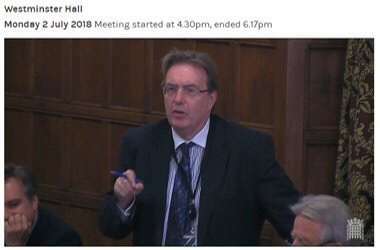 READ THE FULL HANSARD TRANSCRIPT :- https://hansard.parliament.uk/commons/2018-07-02/debates/05B60093-01C7-43ED-B469-55E8164A0D2B/PetTheft.